AAEM Resident and Student Association : Needle Thoracostomy: Is it Time to Switch to a Longer Needle? Recent retrospective reviews and radiologic-based analyses have suggested a high relative NT failure rate when comparing different needle sizes and needle insertion locations. [1, 3-8] In order to perform the procedure successfully, the needle must be of adequate length to transverse the chest wall and enter the pleural space. Failure rates with a 5 cm needle have been demonstrated between 4% to 50%, and up to 65% with a 3.2 cm (approx. 1.25 inch) needle. [3, 5] These studies addressed varying needle lengths in multiple chest wall sites in order to determine the optimal overall NT technique in regards to efficacy and safety. In 2016, a retrospective review of 91 NTs performed on 70 trauma patients compared the effectiveness of a 5 cm versus 8 cm (approx. 3.25 inch) angiocatheter placed in the 2nd ICS-MCL. Efficacy was measured by clinical improvement. Patients who underwent NT with a needle length of 8 cm versus 5 cm noted a significant increased efficacy (83% vs 41% respectively). No complications were documented in either group. Radiographic analysis in this study noted that body mass index (BMI) was correlated with an increased chest wall thickness, a finding also consistent in other investigations. [1, 6, 8, 9] Interestingly, BMI ≥30 was not associated with decreased NT efficacy. Additionally, a 2014 retrospective radiologic analysis of 100 trauma patients calculated chest wall thickness from chest computed tomography (CT) and predicted improved theoretical NT efficacy with increased needle length. When comparing 8 cm and 5 cm needle length, theoretical NT efficacy was noted at 96% and 66-81% respectively. Improved efficacy was observed irrespective of anatomical site (4th ICS-anterior axillary line (AAL) or 2nd ICS-MCL). The theoretical risk of injury at any location after measuring the distance to vital structures on imaging was 0% with a 5cm needle and 6% to 9% with an 8 cm needle. The most common sites of injury with an 8 cm needle based on distance to vital structures were the right atrium and left ventricle; however, it must be recognized that poor technique, a shallow angle of entry as opposed to a perpendicular angle of entry (proper technique), would also play a factor in the simulated increased risk of injury to vital structures. Yet despite these findings, it may be important to consider evidence, which reported that an 8 cm needle has an efficacy greater than 96% based on chest wall thickness at all anatomical sites. In this report, there were no statistically significant differences in NT rates based off radiographic imaging between the 4th ICS-AAL and 2nd ICS-MCL. One additional consideration regarding MAL needle placement is the potential higher risk of catheter kinking or occlusion during transport based on the relative lateral location in compared to a MCL needle placement. Occlusion of a successfully placed angiocatheter may result in the reaccumulation of tension pneumothoraces. A simulated NT with a 14 gauge, 1.5 inch angiocatheter placed in the MCL versus the MAL demonstrated an increased incidence of partial or temporary occlusion in patients transported on military stretchers. This finding must be considered during prehospital ground or air transportation in the civilian arena. NT with an 8 cm needle has a relatively high, predicted success rate and optimal safety profile in all sites in comparison to a 5 cm needle. [1, 10] Recently, the Committee for Tactical Combat Casualty Care, and the Pre-hospital Trauma Life Support: Military Edition recommend the utilization of a 14-gauge 8cm angiocatheter placed in the 2nd ICS-MCL or 4th/5th ICS-AAL or MAL for military NT. [1, 3] As is consistent historically with military emergency care techniques and protocols, civilian emergency care guidelines (including ATLS) may soon adapt these recommendations. At present, more research and prospective, large-scale trials may be needed in order to demonstrate the clinical effectiveness and safety of 8 cm needles in the civilian setting. 1. Aho JM, Thiels CA, El Khatib MM, et al. Needle thoracostomy: Clinical effectiveness is improved using a longer angiocatheter. J Trauma Acute Care Surg. 2016 Feb;80(2):272-7. 2. Advanced trauma life support (ATLS(R)): the ninth edition. J Trauma Acute Care Surg. 2013 May;74(5):1363-6. 3. Laan DV, Vu TD, Thiels CA, et al. Chest wall thickness and decompression failure: A systematic review and meta-analysis comparing anatomic locations in needle thoracostomy. Injury. 2016 Apr;47(4):797-804. 4. Givens ML, Ayotte K, Manifold C. Needle thoracostomy: implications of computed tomography chest wall thickness. Acad Emerg Med. 2004 Feb;11(2):211-3. 5. Ball CG, Wyrzykowski AD, Kirkpatrick AW, et al. Thoracic needle decompression for tension pneumothorax: clinical correlation with catheter length. Can J Surg. 2010 Jun;53(3):184-8. 6. Carter TE, Mortensen CD, Kaistha S, Conrad C, Dogbey G. Needle Decompression in Appalachia Do Obese Patients Need Longer Needles? West J Emerg Med. 2013 Nov;14(6):650-2. 7. Stevens RL, Rochester AA, Busko J, et al. 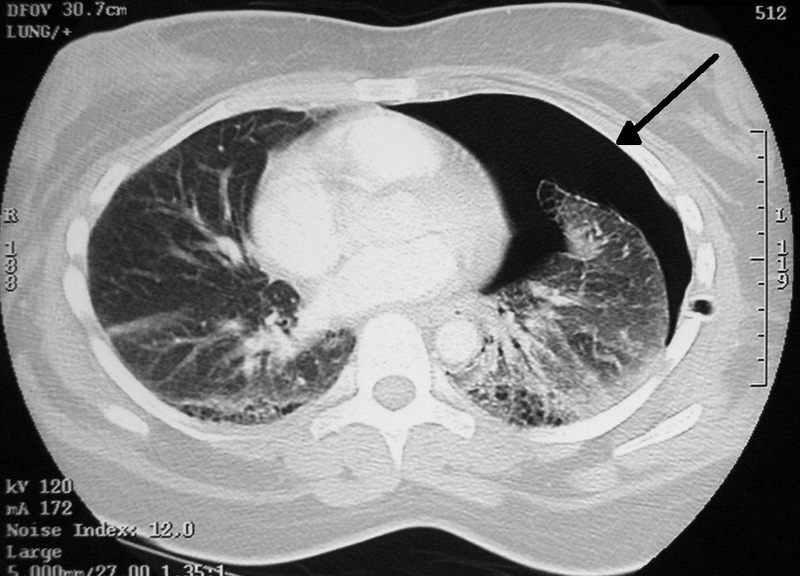 Needle thoracostomy for tension pneumothorax: failure predicted by chest computed tomography. Prehosp Emerg Care. 2009 Jan-Mar;13(1):14-7. 8. Inaba K, Ives C, McClure K, et al. Radiologic evaluation of alternative sites for needle decompression of tension pneumothorax. Arch Surg. 2012 Sep;147(9):813-8. 9. Powers WF, Clancy TV, Adams A, West TC, Kotwall CA, Hope WW. Proper catheter selection for needle thoracostomy: a height and weight-based criteria. Injury. 2014 Jan;45(1):107-11. 10. Chang SJ, Ross SW, Kiefer DJ, et al. Evaluation of 8.0-cm needle at the fourth anterior axillary line for needle chest decompression of tension pneumothorax. J Trauma Acute Care Surg. 2014 Apr;76(4):1029-34. 11. Zengerink I, Brink PR, Laupland KB, Raber EL, Zygun D, Kortbeek JB. Needle thoracostomy in the treatment of a tension pneumothorax in trauma patients: what size needle? J Trauma. 2008 Jan;64(1):111-4. 12. Beckett A, Savage E, Pannell D, Acharya S, Kirkpatrick A, Tien HC. Needle decompression for tension pneumothorax in Tactical Combat Casualty Care: do catheters placed in the midaxillary line kink more often than those in the midclavicular line? J Trauma. 2011 Nov;71(5 Suppl 1):S408-12.